Azure AD にデバイスを設定して、クラウドとオンプレミスのリソースでのシングル サインオン (SSO) を実現することで、ユーザーの生産性を最大化できます。By bringing your devices to Azure AD, you maximize your users' productivity through single sign-on (SSO) across your cloud and on-premises resources. 同時に、条件付きアクセスを使用して、クラウドとオンプレミスのリソースへのアクセスを保護することもできます。At the same time, you can secure access to your cloud and on-premises resources with conditional access. このチュートリアルでは、マネージド ドメイン内のデバイスのハイブリッド Azure AD 参加を構成する方法を学習します。In this tutorial, you learn how to configure hybrid Azure AD join for devices in managed domains. 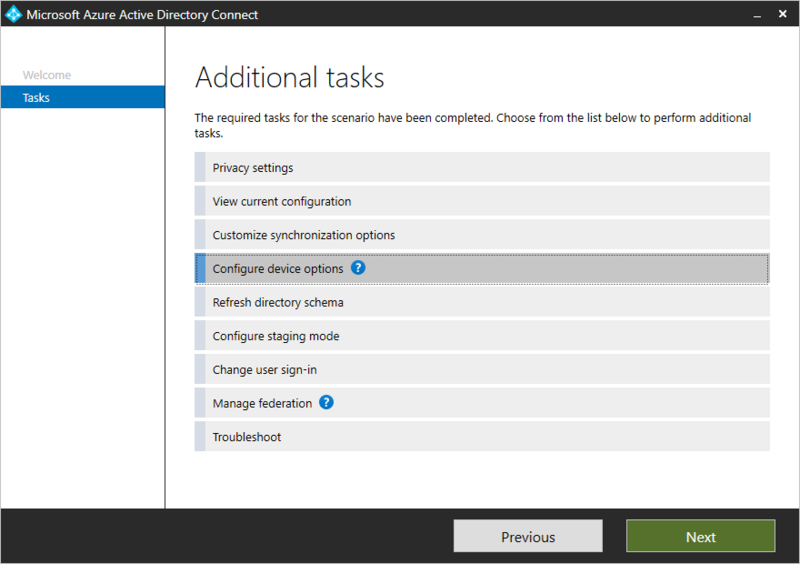 最新バージョンの Azure AD Connect (1.1.819.0 以降) がインストールされていること。The latest version of Azure AD Connect (1.1.819.0 or higher) to be installed. 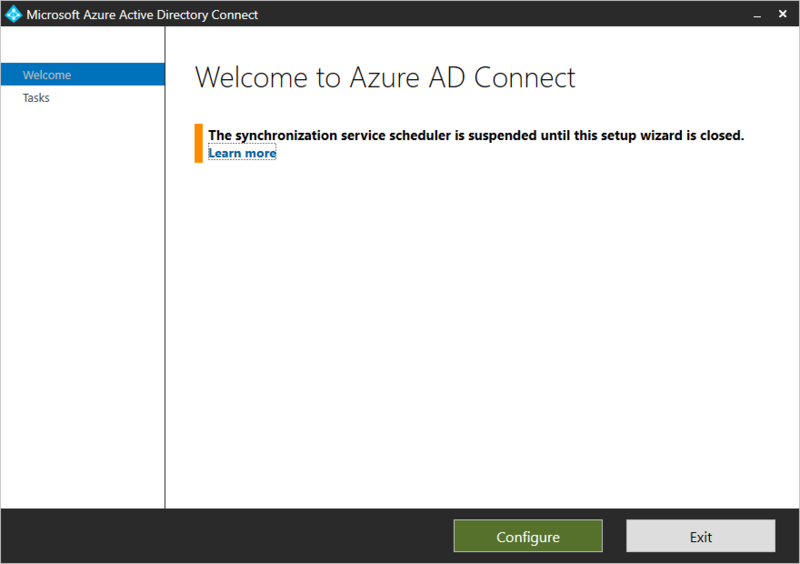 Azure AD Connect が、Azure AD に参加するハイブリッド Azure AD にするデバイスのコンピューター オブジェクトを同期済みであることを確認します。Verify that Azure AD Connect has synchronized the computer objects of the devices you want to be hybrid Azure AD joined to Azure AD. コンピューター オブジェクトが特定の組織単位 (OU) に属している場合、これらの OU を Azure AD Connect についても構成する必要があります。If the computer objects belong to specific organizational units (OU), then these OUs need to be configured for synchronization in Azure AD connect as well. 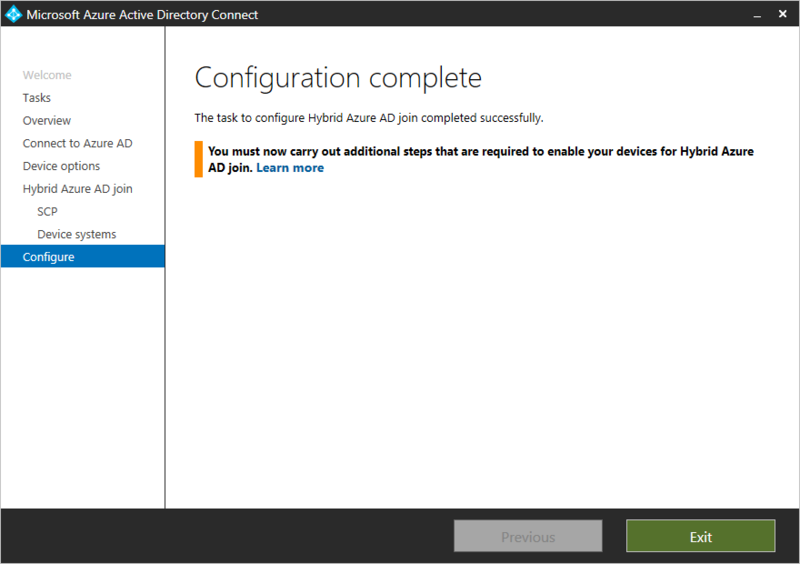 バージョン 1.1.819.0 以降の Azure AD Connect には、ハイブリッド Azure AD 参加を構成するためのウィザードが用意されています。Beginning with version 1.1.819.0, Azure AD Connect provides you with a wizard to configure hybrid Azure AD join. このウィザードを使用すると、構成プロセスを大幅に簡略化できます。The wizard enables you to significantly simplify the configuration process. 関連するウィザードは、デバイス登録のためのサービス接続ポイント (SCP) を構成します。The related wizard configures the service connection points (SCP) for device registration. この記事の構成手順は、このウィザードに基づいています。The configuration steps in this article are based on this wizard. Windows 10 1709 以降では、組織が送信プロキシ経由でインターネットにアクセスする必要がある場合に、グループ ポリシー オブジェクト (GPO) を使用してコンピューターのプロキシ設定を構成できます。If your organization requires access to the Internet via an outbound proxy, starting with Windows 10 1709, you can configure proxy settings on your computer using a group policy object (GPO). お使いのコンピューターで Windows 10 1709 より古いバージョンが実行されている場合は、Web Proxy Auto-Discovery (WPAD) を実装して、Windows 10 コンピューターが Azure AD にデバイスを登録できるようにする必要があります。If your computer is running anything older than Windows 10 1709, you must implement Web Proxy Auto-Discovery (WPAD) to enable Windows 10 computers to do device registration with Azure AD. 組織が認証された送信プロキシ経由でインターネットにアクセスする必要がある場合は、Windows 10 コンピューターが送信プロキシに対して正常に認証されることを確認する必要があります。If your organization requires access to the Internet via an authenticated outbound proxy, you must make sure that your Windows 10 computers can successfully authenticate to the outbound proxy. Windows 10 コンピューターではマシン コンテキストを使用してデバイス登録が実行されるため、マシン コンテキストを使用して送信プロキシ認証を構成する必要があります。Because Windows 10 computers run device registration using machine context, it is necessary to configure outbound proxy authentication using machine context. 構成要件については、送信プロキシ プロバイダーに確認してください。Follow up with your outbound proxy provider on the configuration requirements. 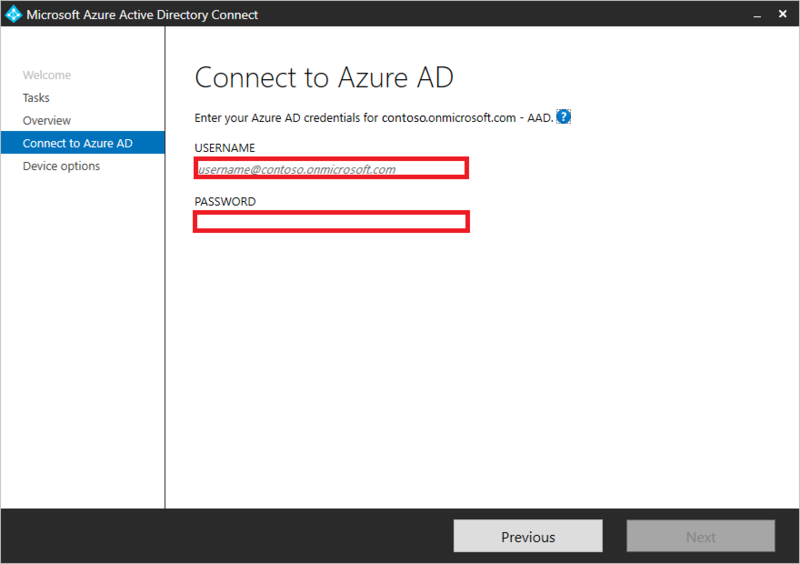 Azure AD テナントの全体管理者の資格情報。The credentials of a global administrator for your Azure AD tenant. 各フォレストのエンタープライズ管理者の資格情報。The enterprise administrator credentials for each of the forests. Azure AD Connect を起動し、[構成] をクリックします。Launch Azure AD Connect, and then click Configure. [追加のタスク] ページで、[デバイス オプションの構成] を選択し、[次へ] をクリックします。On the Additional tasks page, select Configure device options, and then click Next. [概要] ページで、[次へ] をクリックします。On the Overview page, click Next. 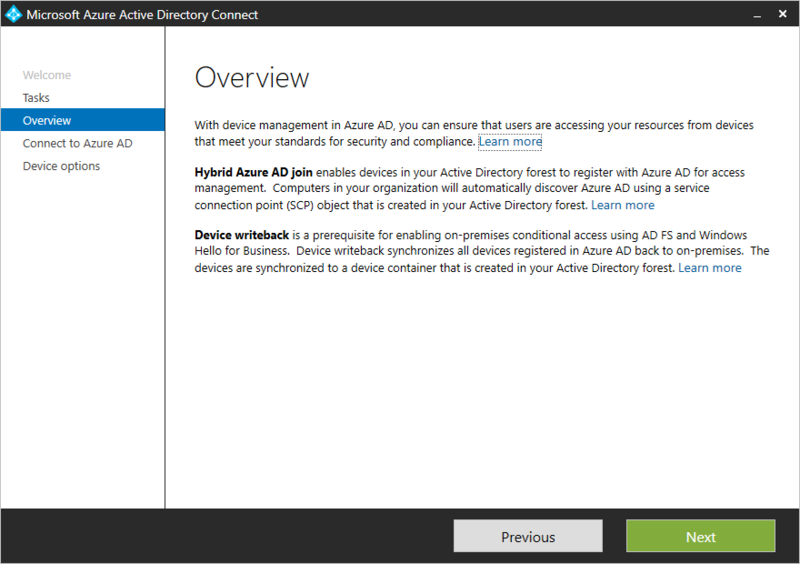 [Azure AD に接続] ページで、Azure AD テナントの全体管理者の資格情報を入力します。On the Connect to Azure AD page, enter the credentials of a global administrator for your Azure AD tenant. [デバイス オプション] ページで、[ハイブリッド Azure AD 参加の構成] を選択し、[次へ] をクリックします。On the Device options page, select Configure Hybrid Azure AD join, and then click Next. b.b. 認証サービスを選択します。Select the authentication service. c.c. [追加] をクリックして、エンタープライズ管理者の資格情報を入力します。Click Add to enter the enterprise administrator credentials. 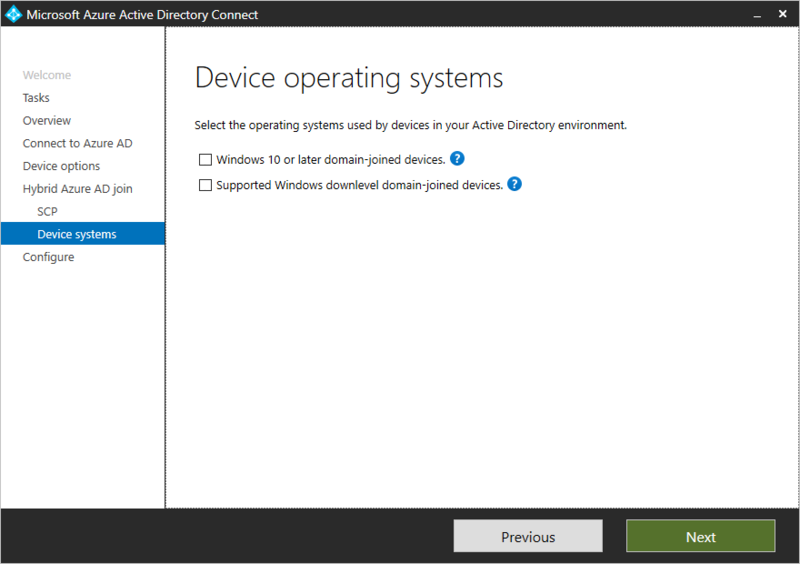 [デバイスのオペレーティング システム] ページで、Active Directory 環境内のデバイスで使用されているオペレーティング システムを選択し、[次へ] をクリックします。On the Device operating systems page, select the operating systems used by devices in your Active Directory environment, and then click Next. [構成の準備完了] ページで、[構成] をクリックします。On the Ready to configure page, click Configure. [構成が完了しました] ページで、[終了] をクリックします。On the Configuration complete page, click Exit. さらに、ユーザーのローカル イントラネット ゾーンで [スクリプトを介したステータス バーの更新を許可する] を有効にする必要があります。Additionally, you need to enable Allow updates to status bar via script in the user’s local intranet zone. Azure AD クラウド認証方法として Pass-through Authentication (PTA) または Password Hash Sync (PHS) を使用しているマネージド ドメインで、ダウンレベルの Windows デバイスのハイブリッド Azure AD 参加を正常に完了するには、シームレス SSO を構成する必要もあります。To successfully complete hybrid Azure AD join of your Windows down-level devices in a managed domain that is using Pass-through Authentication (PTA) or Password Hash Sync (PHS) as your Azure AD cloud authentication method, you must also configure Seamless SSO. ダウンレベルの Windows デバイスを登録するには、Windows インストーラー パッケージ (.msi) をダウンロード センターからダウンロードし、インストールする必要があります。To register Windows down-level devices, you need to download and install a Windows Installer package (.msi) from the Download Center. 詳細については、こちらをクリックしてください。For more information, click here. 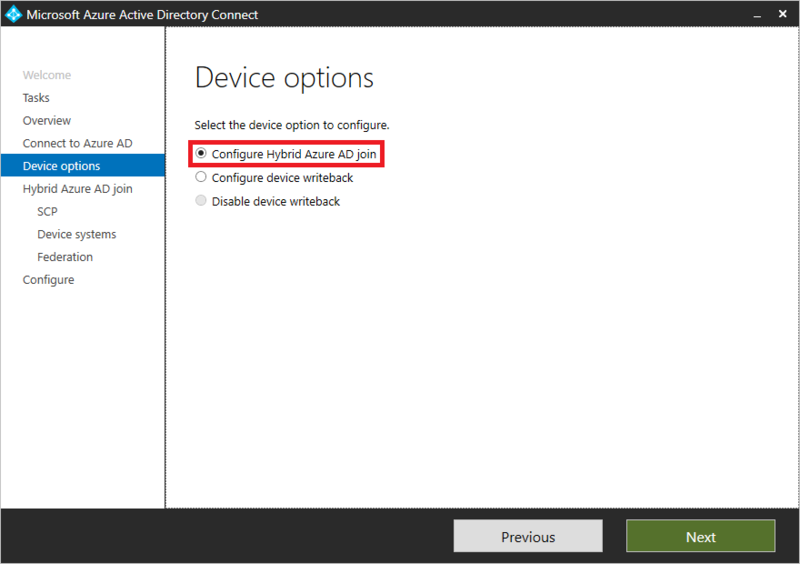 Azure テナントのデバイス登録状態を確認するには、Azure Active Directory PowerShell モジュール の Get-MsolDevice コマンドレットを使用できます。To verify the device registration state in your Azure tenant, you can use the Get-MsolDevice cmdlet in the Azure Active Directory PowerShell module. Windows クライアントの ID と一致するデバイス ID を持つオブジェクトが存在する必要があります。An object with the device id that matches the ID on the Windows client must exist. DeviceTrustType の値は [ドメイン参加済み] でなければなりません。The value for DeviceTrustType must be Domain Joined. これは、Azure AD ポータルの [デバイス] ページの [ハイブリッド Azure AD 参加済み] 状態に相当します。This is equivalent to the Hybrid Azure AD joined state on the Devices page in the Azure AD portal. 条件付きアクセスで使用されるデバイスの Enabled の値は True、DeviceTrustLevelの値は Managed でなければなりません。The value for Enabled must be True and DeviceTrustLevel must be Managed for devices that are used in conditional access. Windows PowerShell を管理者として開きます。Open Windows PowerShell as administrator. 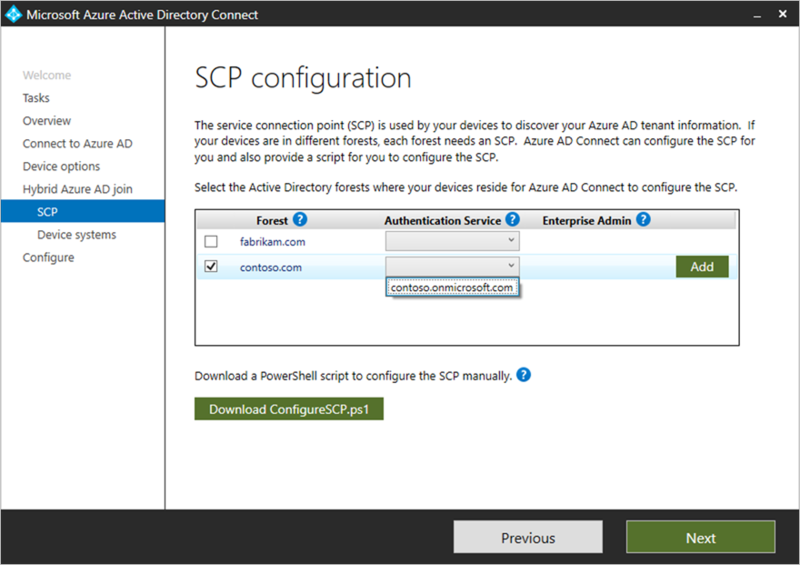 「Connect-MsolService」と入力して Azure テナントに接続します。Type Connect-MsolService to connect to your Azure tenant. 「 get-msoldevice -deviceId <deviceId>」と入力します。Type get-msoldevice -deviceId <deviceId>. [有効] が [True] に設定されていることを確認します。Verify that Enabled is set to True.